← holy moly – it’s a podcast! The physical pangs of hunger and thirst for a bite to eat or something to drink can be admittedly overpowering; but recently in the midst of government shutdowns, mad hatter tweets, guilty pleas, not guilty pleas, 2020 presidential candidates throwing imaginary hats into a very real ring, Super Bowl commercials, Oscar buzz, Netflix binge watching — my yearnings have been more mental than physical. Today the Music Man brother of Pretty Too, Number One Son’s wife, shared two pictures along with a story that unexpectedly changed my outlook on life. Patrick a/k/a Music Man was in San Antonio, Texas last week finishing up a tour in Texas and saw a little boy carrying a pet duck along the River Walk to the San Antonio River. 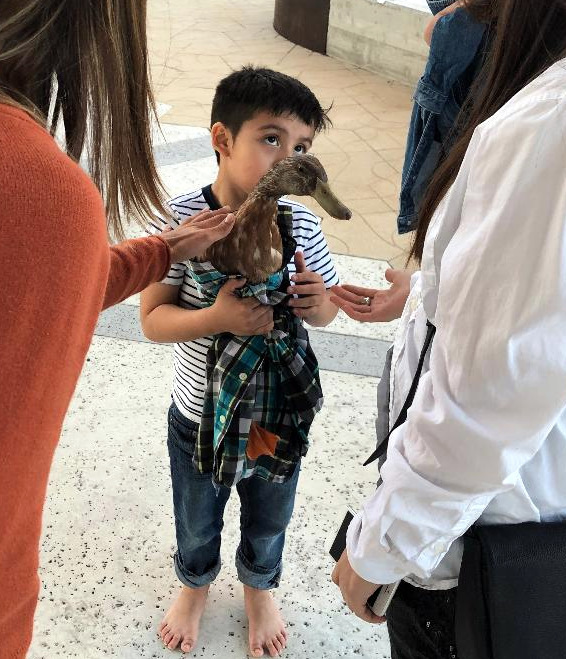 The little boy released the duck at the riverbank whereupon the duck went for a swim – and then returned to the little boy who scooped the wet duck into his arms and told someone who asked him that his duck’s name was Macho. Thanks so very much to Patrick Jeffords for these remarkable photos and for allowing me to share them with my friends in cyberspace. I feel refreshed, hopeful and wishing I had a pet duck like Macho. This entry was posted in Humor, Lesbian Literary, Life, Personal, photography, politics, racism, Reflections, Slice of Life, The Way Life Is and tagged boy with pet duck, music man, san antonio texas. Bookmark the permalink. Children and animals always restore my too easily ruffled equanimity. 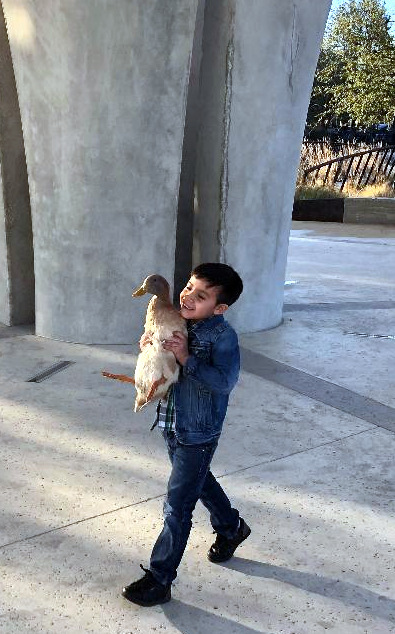 Nice story and photos about the boy and his duck. I have never had a pet duck… I have had a pet chicken, a pet calf, dog, cat, lamb. The calf was my favorite because I helped the cow deliver it so I was close to being some sort of an aunt, I guess?